A new examination of mass digitization as an emerging sociopolitical and sociotechnical phenomenon that alters the politics of cultural memory. Arguing that digitization has become a global cultural political project, Thylstrup draws on case studies of different forms of mass digitization?including Google Books, Europeana, and the shadow libraries Monoskop, lib.ru, and Ubuweb?to suggest a different approach to the study of digital cultural memory archives. She constructs a new theoretical framework for understanding mass digitization that focuses on notions of assemblage, infrastructure, and infrapolitics. 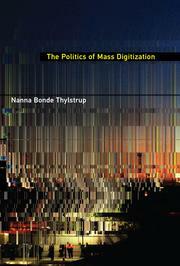 Mass digitization does not consist merely of neutral technical processes, Thylstrup argues, but of distinct subpolitical processes that give rise to new kinds of archives and new ways of interacting with the artifacts they contain. With this book, she offers important and timely guidance on how mass digitization alters the politics of cultural memory to impact our relationship with the past and with one another.